Preheat grill to high. Shuck corn; set aside. Place the Garlic Gold® Oil and herbs in a blender and process until smooth. Pour mixture into small bowl. Set aside. Place corn cobs on rimmed cookie sheet and brush with some of the Garlic Gold mixture. Place seasoned corn cobs on hot grate and grill, turning with tongs until well browned, about 10 minutes, brushing occasionally with garlic mixture. 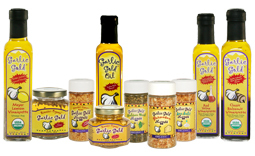 Serve immediately with additional garlic mixture and Garlic Gold® Sea Salt Nuggets and freshly ground pepper to taste. Grilled fresh corn always seemed like such a fuss—yikes. I was usually the one stuck cleaning the grill, so here’s what you do. Just boil an ear of fresh corn until it’s done the way you like it. It is much easier to clean a boiled water pot than that darn grill. Then, put a little Garlic Gold® (nuggets in oil) on it, salt and pepper if you want, grab lots of napkins, and dig in!